You’ve just purchased your brand new Brompton folding bike and you’re ready to ride! The Brompton is one of the best riding bikes on the market, and the foldability makes it easy to incorporate cycling in your daily life. How can you enhance your Brompton experience? We’ve compiled this list of our favorite accessories that will make you love your Brompton even more! The Brompton toolkit has all the tools you need to fix a flat or make adjustments while out on a ride. What makes this tool functional and innovative is that it fits in the front top tube of the bike frame, secured by magnets. So there’s no need to take up space in your bag and still have all the tools you’ll need. Brompton has a wide selection of bags that fit on the front carrier block of the bike, ranging from small and compact to large touring size. One of our favorite bags is the basket bag. This bag is perfect for trips to the grocery store, or farmer’s market. It’s open design is not fussy and simple to carry on or off the bike. To make your bike safe to ride at night, a good light set is an essential accessory. 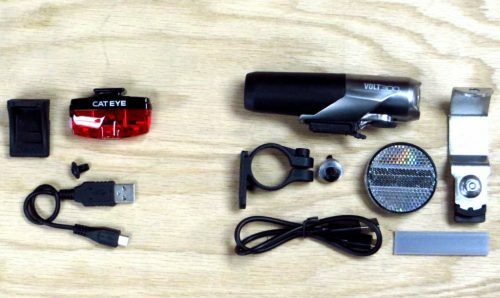 The Cateye light set for Brompton features a USB rechargeable 400 lumen headlight with five settings. Also, it includes a USB rechargeable Rapid Mini saddle light, which ingeniously integrates with the Brompton saddle. Be safe and be seen. If you purchased your Brompton from Portapedal, chances are it includes a rear rack and rollers. You have the option to upgrade to Eazy Wheels, a bigger/smoother wheel. We order all our Bromptons with the Rear Rack because it makes the bike much more user friendly. 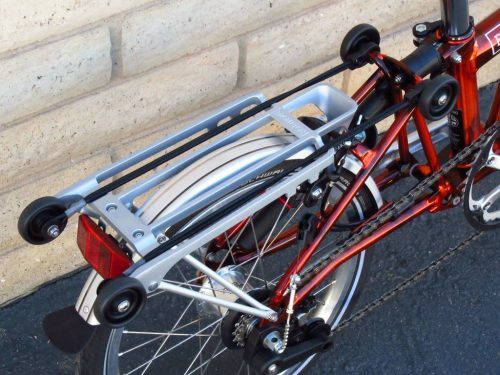 Not only can you carry bags or items on your rear rack while riding, the rack and Eazy wheels make the bike easy to push or pull along while folded. There is no need to pick up and carry your Brompton each time. A lot of our Brompton customers opt for the Ergon gips for their bikes. These grips are much softer and more comfortable than the stock grips, and allow for longer rides with less wrist pain. We cut the grips here in the workshop in order to fit your specific handlebar, and the new grips are easy to install with just a few bolts to screw in. 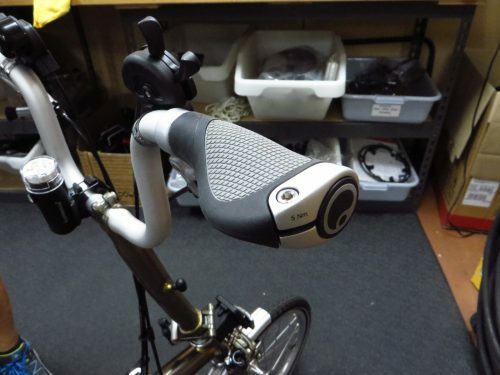 The Ergon grips are a great first modification for your new Brompton bicycle.